We were on our way back from Nagarahole through Wayanad. I returned through a different route that bypassed Kalpetta and reached Vythiri directly from Mananthavady. (After Mananthavady this route passes through Dwaraka, Tharuvana, Padinjarethara, Pozhuthana and hits the Kozhikode- Mysore highway at Vythiri). It is a five kilometers shorter but takes a little longer to drive as it is more winding than the highway. If you want to go in the direction of Banasurasagar Dam this is the route to take. After Vythiri the Downhill starts; some 10 kilometers of excellent ghat roads. Once you reach Adivaram, the first village below the ghats the rest of the drive is through roads winding through small towns with intervening stretches of mostly rubber estates. Dwaraka, off the coast of Gujarat is Lord Krishna's mythical capital. It was apparently swallowed by the ocean six times and the present city is the seventh, probably waiting for it's turn to be swallowed by the ocean. The Dwaraka in Wayanad fears no such calamity as it is perched high above kissing the clouds. It would have been just another town and I'd have driven through it without a sideward glance if it had not been for this. I actually drove past it before my brain whirred and clicked. I wasn't sure what I'd just seen so I turned around and came back to this unusual but beautiful sight. A neat church with an eye catching piece of sculpture at the gate. Jesus Christ on Arjuna's chariot. 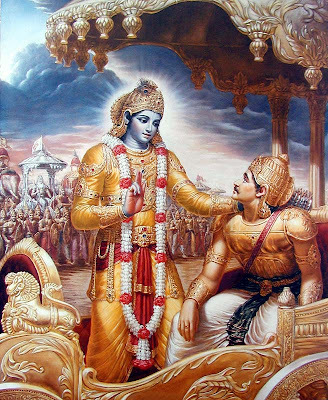 Lord Krishna was Arjuna's charioteer in the battle at Kurukshetra. Before the battle begins Arjuna asks Krishna to take the chariot between the two opposing forces. 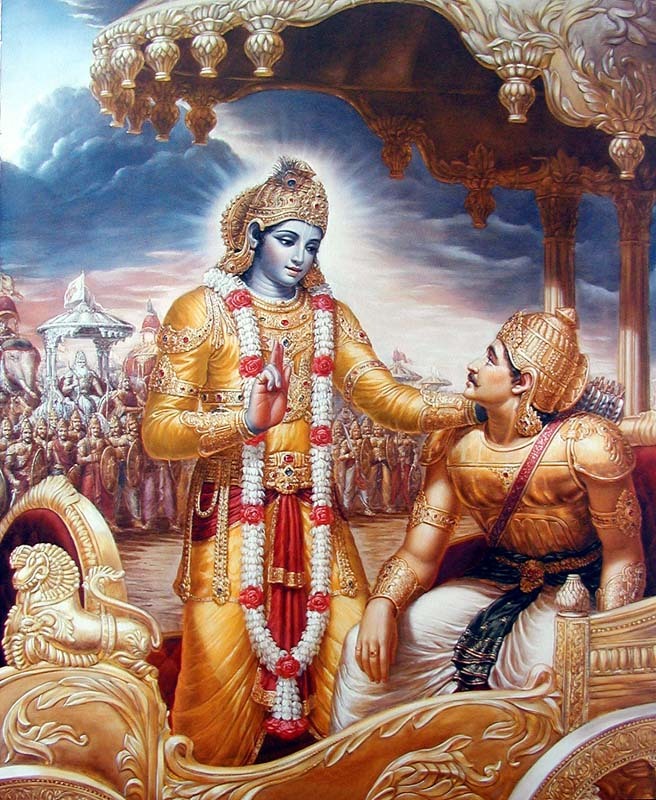 The realization that he was to face his cousins, elders, teachers and friends makes Arjuna despondent and he lays down his arms and turns to Krishna for advice. The conversation between them forms the escence of the Bhagavad Gita. The Pandavas won the war and eventually the Dvapara yuga reached its end with the passing of Krishna from his earthly avatar. Now, the Kali yuga is a period where humans degenerate spritually and the earth will be strife ridden. Of the many attributes of the Kali yuga that the Mahabharata describes, the most ominous is about human relationships. I'm sure my reader, every sentence above is a familiar happening in this era. Perhaps, Jesus has a reason to be on the chariot. He needs to reach out not to a few million but billions of wayward humans. It is a sobering thought, that the Mahabharata described so precisely what we are faced with today. It will take the combined might of Allah, Jesus and Krishna to turn this world around. superb.. yet another copying.. and you are posting it and appreciating it.. sad.. kerala secularism is maddening...!! Christianity is so hollow that it has to appropriate the great Sanaatana Dharma to become relevant. Its been happening for 2000yrs in Kerala but now more aggressive. Breaking India by Rajiv Malhotra must read. This is known as digestion. All religions, are same argument. Then have just one xianity. Wake up pl.